Insidious's original scriptwriter Leigh Whannell takes over directing duties for the third chapter, and you can't blame him for taking the franchise in a new direction. Shame that he drops everything that had made it so memorable so far in the process. This third film is darker, and somehow scarier, but a lot more generic too. Gone is the haunted funfair vibe, with which some seemed to have a problem with but that I loved, instead we get a possession film that is indistinguishable from the plethora we have endured over the last decade. 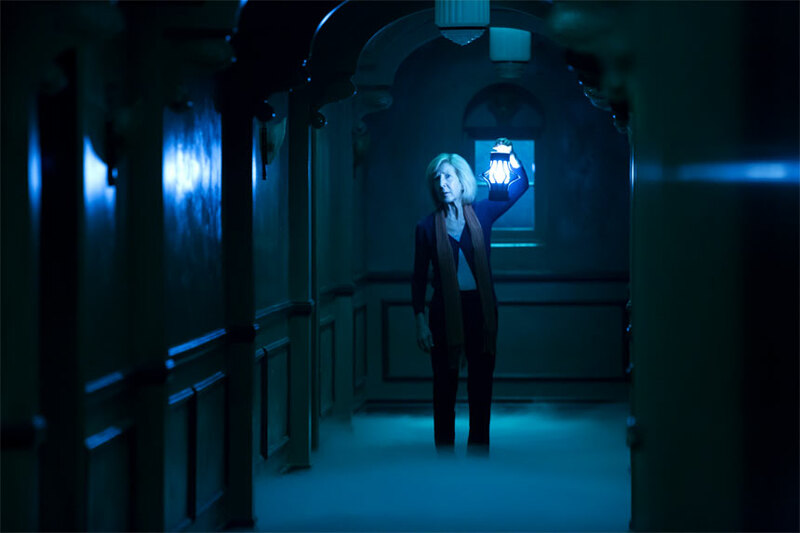 This new chapter is actually a prequel, which means Elise (Lin Shaye) is still (SPOILER for the first film) in the world of the living, and it was a great idea to have her as the lead... except that she isn't really, it feels as if it was the original premise until the studios and the team behind the film had cold feet and doubts about the commercial viability of a film fronted an older woman. And while she gets a slightly increased screen presence, she is lumbered with a lazy backstory that is barely explored. In the first films we had a young family battling up with a demon and their own anxieties as parents, and they were relatable and engaging characters, especially thanks to the performances of Rose Byrne and Patrick Wilson. Here we have a cringe-worthy plot that has a troubled teen (Stefanie Scott) with acting dreams unwittingly calling out a demon when trying to contact her deceased mum. And Dermot Mulroney as her dad is given some of the most laughable lines we're likely to hear all year. The new demon is rather frightening initially when barely seen, (and there are plenty of unoriginal but efficient jump scares), yet once fully unleashed its design is a lot less striking than the red and black creature of the first two chapters. And the scary old lady ghost is back too for a few brief scenes but here we see far too much of her and it is obvious that this is a man in bad old woman drag, like a zombie Mrs Doubtfire, eliciting a few unintentional chuckles (she is played by Tom Fitzpatrick). Yes it is pleasant to see how the original teaming of Elise and Tucker & Specs came to be, don't expect a great character developtment, more a "shall we work together? Sure, why not" kind of scene tagged along at the end to bridge it with the other films. And one nod to Elise future faith in the franchise might have made fans smile, did we really need 47 very obvious nods being hammered down the audience? Yes, we get it! It is hard to know where the studio will want to take the franchise from here, but it might want to leave it die a good death after this uninspiring chapter.